A classic meal for four on a cold day, before the festive season’s proliferation of turkey meals. You’ll need greaseproof paper and some chunky country bread. Preheat the oven to 170C/350F/Gas 4. Peel and cut the onions into four wedges each. Cut the potatoes in half and peel and cut the parsnips into quarters. Peel and cut the garlic cloves into halves. 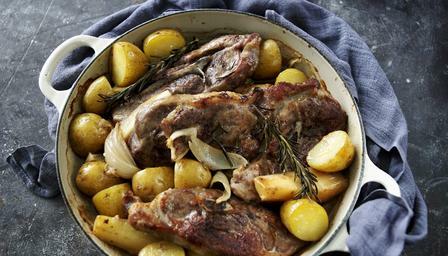 Lightly dust the lamb chops with the plain flour while you heat a good tablespoon of olive oil in an ovenproof pan for which you have a lid. Add the lamb and brown on both sides, remove and set to one side. Add the onions, parsnips, and garlic to the pan and cook for about 3 minutes, season with salt and freshly ground black pepper, return the lamb, add rosemary sprigs and the potatoes around the chops. Pour over enough water to cover the meat and vegetables then cut a circle from your greaseproof paper to fit inside the pan on top of the water. Cover the pan with the lid and cook in the oven for about an hour, checking the meat is tender. Serve with crusty country bread.